Coming back real soon with exciting news! When I opened my March "Freedom of Speech" I was struck by the lovely colour combo & set about making a page focusing on the red & navy. 45 & ... The title was inspired by the ampasands in this kit & gave me a chance to document things about me right now. I used the speech bubble stickers plus their outline to custom make the background. I drew around 2 of the stickers to make masks so I could ink speech bubble shapes on the background too. The fabric was cut into a rough circle & using a running stitch turned into a yo yo or suffolk puff - I think they are called! The whole page was finished with hybrid elements, the bespoke card, Maya Rd kraft girls & my typed journalling. We look forward to seeing your creations with this March kit. 2014 GoGoGetaway Prize Draw - THIS SUNDAY!!! Are you thinking about coming to one of our Events in 2014? - then read on!!! This March (2013) we are celebrating our 10th Anniversary GoGoGetaway and we feel that it is only right that we celebrate in style! We are offering a promotional extravaganza for both our events in 2014!! If you book and pay your deposit for EITHER of our 2014 events at Theobalds Park, BEFORE 2pm on Sunday 24th March 2013 then we will place your name into a draw which will take place during the Prize Giving Ceremony on that day, at the end of our Anniversary Getaway! There will be two draws, one for March 2014 and one for October 2014 and the lucky person who is pulled out of each draw will have NO MORE TO PAY. Their deposit will be converted into FULL PAYMENT and will be the only amount they need pay for the whole event - making these prizes worth in excess of £250 each. This draw is open to EVERYONE who has paid their deposit 2pm on Sunday 24th March 2014 - so if you are not attending this event please do not worry, your name will be entered and this will be verified and confirmed by an independant witness at the event. If you have already booked and paid your deposit, you will also be automatically entered into the draw. Hurry - places are selling fast and you have to be IN IT to WIN IT! I hope you had a lovely Mothers day & were thoughly spoilt x I had a lovely day with my children & thought I'd share with you this quick Lo I made of them with the last of my February kit. Love is ... my 3. To go in the frames I cut from the Authentique Greeting patterned paper I printed photos of my children at approximately the same age- 6 months old & I was surprised how similar they all look. The red, white and blue from the kit has allowed me to have some fun with a photo I took while I was on holiday with Paul in May 2010. I have used elements from the Authentique Lovely - Greeting to form my embelishments. By cutting out one of the characters I created the frame for my title which was secured on the LO with foam pads. I have coloured the alphas in white leaving a brown outline, as the "block" brown looked a little too harsh, I made a gloss effect with my Glossy accents. Using the white Bazzill as a base I have splashed some blue and white ink on the page with my dropper and added punched blue and red hearts. I framed the photo with the hybrid tickets and punched red hearts. It's a fun LO with a true sentiment. I am in love with the February kit and decided to have a play with the pink within the kit to show that it is versitile and can be used with photos of boys. The picture was taken at Paul's 40th in May 2012, Noah had great fun and danced the whole night in his little "tux". The pink and white stitched hybrid gave me a great idea for the theme of on the LO. I cut the paper into 1cm strips and then folded each one in half. To get the spirals I rolled the paper up tightly securing the end with strong glue. Once the mounted photo was in place I placed the spirals into a heart shape. I found it was easier to draw the shape of the heart and then place the spirals on the outline of the heart and fill it in, again using a strong glue to secure. The background of my Bazzill paper was created using the "pink stitched heart" as a template, I cut the white heart out and used this as a mask to paint through in pale pink and cream paint from my own supplies. Once dry I stitched the outline of the hearts to give them definition. 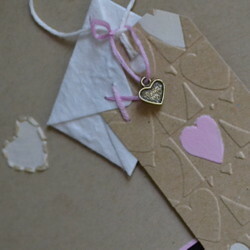 I assembled the embelishments together on the tag, stitching a Kiss on the envelope, after painting some detail on the tag. I also placed the string from the tag in a heart. This gave me my title Sealed with a loving kiss. The LO reminds me of neopolitan ice cream. I am happy as I have been able to use the pink from the kit although the LO is not too "girly". It will be my 40th this year, I wonder what photos I will have to scrap from that? I loved this photo of my mother and her great grandaughter Abbie the moment I saw it. It's one of those photo that tells a story and shows a real connection between two people. Abbie was so interested in the crochet and wanted her mumma to teach her to knit. To start the layout I first placed the alphabet stickers for the title to use as a mask. You really need to reduce the stickiness of the letters to use that technique. I do that by firstly sticking the letters to my jeans, pulling them off and then sticking them to the cardstock. The spray is watered down acrylic paint put into a spray bottle. When the spray was nearly dry I removed the stickers. When the paint was completely dry I outlined the masked title with black pen to define the title and make it stand out. My circle punches got a bit of a workout, and I machine stitched them on to add some texture to the page. I also stitched the photo on, which gave it a kind of frame. So all in all, a simple layout, with added interest from the spray paint and the stitching. I just hope I did the sweet photo justice! Do you melt at babies feet? Why are babies feet so darn cute? I was lucky enough to meet Ava just before Christmas. She was only a couple of weeks old, weighing a teeny 5lb! I must admit to the photo being staged somewhat, as we tried numerous poses with her Mummy and Daddy for the perfect picture. The muted colours in the image were perfect for the February kit - by adding the reference to little girls in the title and key pink and red embellishments it was clear it was a little girls feet! Has your February kit arrived yet? I love this photo, not becuase it's a great photo because it's not but because it captures the briefest of moments. You see Jon is not one for grand displays of affection in public and this was taken on a trip to London. The soft romantic feel to February's Essentially GoGo kit was spot on for scrapping this photo. The flowers for the LO are easy to make with a little time and patience but don't use a whole lot of patterned paper however making them becomes a little addictive once you start. I made 14 but ended up only using 7! 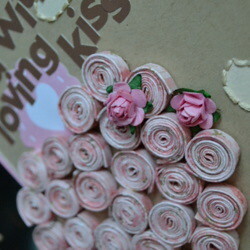 Check out Rebekah's easy flowers post for instructions. An oversized mat of layered patterned papers from the kit made a pretty background for this photo. Touches of dry brushed paint soften the edges of the patterned papers made them appear less stark. The altered gold foil paper lace doily I used as a small accents on the LO together with two heart ribbon tabs, a little paint gave them a softer look. I have 7 flowers left, wonder what I should create with them? I have to confess that I'm not into Valentine's day so I don't often buy Valentine themed products. However the great thing about the Valentine's elements in the February Kit is that with a little 'out of the box' thinking they can be used in non-valentine layouts. 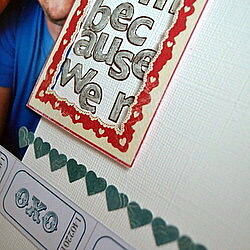 Take this layout-it's all about love, but not the romantic Valentine kind. The layout was inspired by the picture of the little girl in the blue dress. It reminded me of Emily's much loved rag doll, Betty Blue. To make the layout I first cut a large heart shape from copy paper and placed it on the embossed cardstock to use as a mask. I then dry brushed white acrylic paint over the page. To dry brush it is important to wipe most of your paint onto scrap paper before brushing over the card. When the paint was dry I added some black pen and white pen detail to the heart shape. I layered some patterned paper, including the fussy cut border-and the trimmings from the fussy cutting. Some hybrid elements and ribbon were used to embellish the page. The photo is not the best quality since it was taken in the days of film-and when I knew nothing about photography! But it's the memory that's important, so please remember to use your old photos too. This time it was the picture of the little girl posting a letter that gave me the idea for the card. So if you are not into Valentine's day don't dismiss this paper-instead take a closer look and see if you can find other ways of using the images. How is your month going? Have you been "snapping away"? I have been collecting photos for my February Month in Review with a love, love, love feel. For my Month in Review's I decided I will place my LO's on 8 1/2" x 11" (A4) each month, as this is a new size for me to have a play with. Also each month my LO's will be of the boys capturing their growth and development as the year passes, with a focus word for each LO. For January I chose "Play" for which Noah had the opportunity to experience snow and Joseph has loved sitting supported exploring new textures. I used the Bazzill Basics Sunflower as my base card. I did not having much left from my kit only strips and off cuts of the Pink Paislee papers; Incredible, Amazing and Unbelievable. I joked with my husband Paul that I only had enough kit left the size of a "postage stamp" and "bingo" I had an idea for my LO. I have used a Die Cut the shape of a stamp with serrated edges for both my papers and side photos of the boys. With the main photo for both Noah and Jospeph I have also managed to fit another 3 of each on the page and the page is smaller to what I am used to playing with too. To give a little lift I placed some photos and paper on the LO with foam pads and also a few punched snowflakes too. 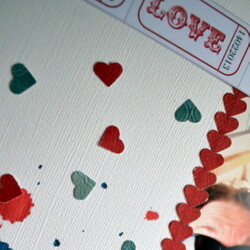 I had enough paper left to make 2 strips which I have placed behind the photos, with the boys initials on. I gave each strip the serrated edge both top and bottom and with just a little tucking out from the photo they look like the "stamp" shapes I have on the LO. I have written about the boys favourite play for January on the reverse of the tags. To give the LO a title my trusted ticket punch came out, I drew the word on the page and then glued each punched circle on overlay each a little whilst following the line. I have placed Jan to the bottom of the page using my Thickers from the kit on the ripped edge with the "2013" stamped in white, from the kit tucking out from behind the ripped paper. 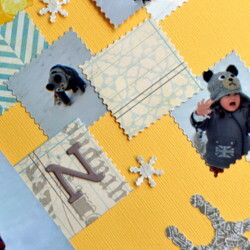 A fun filled LO with 8 photos, punched, cut and ripped papers, hidden journaling on a tag and some stamping too, what a positive way to start the year and now it won't be long before I have another LO in my album.